How to install latest Openshot in Ubuntu and derivatives - The next version of OpenShot has been released. The update brings some new features, better performance, new title templates, and bug fixes! 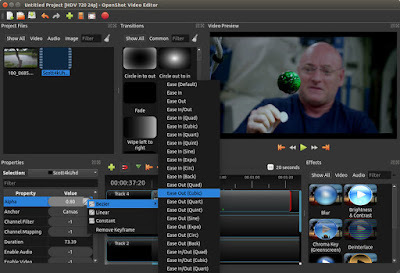 OpenShot Video Editor is one of the best video editors for Linux. It's free software that you can redistribute it and/or modify under the terms of the GNU General Public License as published by the Free Software Foundation. This software support many audio, video and image formats. Over the past few months, improvements to performance have been the top priority. In some cases, performance is improved more than 10x compared to OpenShot 2.1. A new caching engine was built from the ground up, and supports both memory and disk back-ends, depending on the user’s needs. This can be configured in the Preferences, under "Cache". Editing HD videos ( 5K, 4K, 2.5K, and 1080p ) and adding huge images to your timeline is now fully optimized! Many critical bugs have been fixed related to seeking, missing frame detection, and AVPacket scope, which results in a much more stable engine, especially on slower systems. The compatibility has been also improved for Linux AppImage and OS X ( 10.9+ ) App Bundles. This is very useful, and better than the previously hard-coded values. The keyframes are used in the animation system in OpenShot, and have received some major upgrades. They are many other improvements have been made to keyframes such as better undo/redo support when dragging property values ( in the property editor ), rendering color keyframes on the timeline, and improved frame detection when using the property editor ( i.e. adding a keyframe for the currently selected frame ). The latest OpenShot also support for CSS syntax ( quadratic bezier curves ) now allows a %-based approach to setting the curve handles. Many Kickstarter backers requested new title templates to be added to OpenShot. I am proud to announce that all new titles are now included in OpenShot 2.2. They have some really nice additions, such as Film Ratings, TV Ratings ( small corner rating ), and more! The OpenShot 2.2 can be installed on Ubuntu 14.04, Ubuntu 16.04, Ubuntu 16.10, and its variants e.g Elementary OS and Linux Mint by adding its stable PPA and installing / upgrade the latest release. Optionally, you can open the Software Updater and upgrade the OpenShot after checking for updates. Once new OpenShot installed, you should be able to launch it via Unity dash or other Ubuntu app launcher like Synapse. These were all the step by step tutorial to install and update OpenShot to latest version in Ubuntu and derivatives like Linux Mint, and Elementary OS. Alternatively, OpenShot Video Editor 2.2 is available for Linux, Mac OS, and Windows. All you need is head to its official website and grab the OpenShot App Image ( 220 MB ).